I will…. tell the next generation the glorious deeds of the LORD and His might, and the wonders He has done (Psalm 78:4). In a recent conversation with a woman I barely knew, she mentioned that her doctor had suggested bringing her college bound daughter to his office before leaving for school so they could talk about contraception. 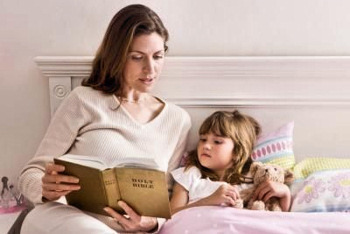 I asked her what she thought of that idea, adding that we had taught our children to live according to God’s Word so that they could give the gift of purity to their future spouse. Clearly, by her silence, I had stunned her with my archaic sounding suggestion, but when she finally recovered, her response grieved me. With unashamed honesty she said, “I don’t know how I feel about that. I didn’t get married until my late 30’s and I sure wouldn’t have wanted to wait!” I felt sad for a daughter whose Jewish mother didn’t even give a thought to what God has to say. As I pondered this conversation later, I flashed back to when my own daughter was 16 years old and going through a time of rebellion. As the world pressed in on her, she wrestled with both God and us. One day, in tears of exasperation over something I wouldn’t consent to, she asked why I couldn’t be more like her friends’ mothers who were cool, treated them like friends, and let them do what they wanted to do. My daughter couldn’t have known that when she was born I had prayed that she and I would be close friends in Christ one day. Yet, while her words pierced my heart, in love I stood firm. That’s because, due to a decision made long ago, I knew that Christ must remain on the throne of my life, even if it meant losing my daughter. In a culture that tells us to do what feels right and has removed virtually every moral boundary, what do our daughters need from those who have been entrusted with their spiritual and emotional well being? This woman is increasingly humbled by what Christ did for her by His life and death when she had no love for Him or His kingdom. Although attitudes of entitlement and me-centeredness will tempt her, as she remembers the price Christ paid for her sin, she is quick to repent and put on a spirit of gratitude, thanksgiving and praise to her Lord and Savior. A mother’s most important job is to point her daughter to her Redeemer. This means that the inclination of our hearts is bent towards knowing and loving God above all other earthly affections, including our children. As an act of worship, we trust that God loves our daughters even more than we do. Our daughters must see that we are a slave to Christ, not to them. Our confidence comes through God’s promises and His resurrection power which is made perfect in our weakness. It comes as we rely on Christ’s wisdom, love, and truth even when the winds of culture blow against us. Humility is cultivated as we gaze at God’s holiness, remembering we are great debtors to mercy. As we breathe grace in we will be able to breathe grace out to undeserving daughters, pointing them to a Savior who died for undeserving sinners. When our daughters accuse us of not understanding or loving them because we are unwilling to compromise the truth of God’s Word, we must not give way to fear. We can be certain that, if we are committed to raising children to know and love Christ, there will be a battle. Yet, we must not fight with worldly weapons of control, manipulation, or attempts to be relevant, but with our God given weapons of His Word and prayer. Our daughters need us to fight for them even when they are fighting with us! We live in a world that counsels us to trust our hearts and do what feels right. This “wisdom” completely disregards the truth of Jeremiah 17:9 which teaches that the heart is deceitful above all things and desperately sick. As our daughters experience hormonal swings and the wildly fluctuating emotions of youth, we must set the example by bringing our own emotions under the authority of God’s truth. A godly mother demonstrates by her life that being female is not about living up to stereotypes but displaying the gospel for the glory of God. We have plenty of things to fear as moms and grandmothers, don’t we? We look at what’s going on in the world and all we can see are giants in the land. (Numbers 13) Our hearts become anxious, fearful, and fretful. But a mother gives her daughter a great gift when she fights fear with faith in God’s promises. “Strength and dignity are her clothing, and she laughs at the time to come” (Proverbs 31:25). This happens as she believes, prays, trusts, waits, perseveres, and prays some more. It’s when she remembers that God is sovereign, good, and rules over even the enemies she fears most, that she experiences His peace. A quiet spirit is cultivated as we gaze upon our Savior and become more like Him. The world tantalizes us with many things our hearts desire right now. With a swipe of a credit card we can buy what we want and feel no pain in the moment. With two incomes we can have a bigger house or the vacation of our dreams. Higher education promises worldly success. But the pursuit of these things above Christ often costs us far more than we bargained for. Our children are also tempted by the world’s definition of success, thus, if our goal is happy daughters, we will become slaves to whatever it takes for them to achieve what they believe will satisfy them in the moment. God’s Word teaches us to set our hearts on things above which includes teaching our daughters to prepare for eternity rather than to live for today’s passing pleasures. While no one does this perfectly, this must be the direction of our lives if we want to raise godly daughters in a world that increasingly and unashamedly opposes the family, church, and Christ. While a college education is a wonderful privilege, are we subtly counseling our daughters to desire career above marriage and family? Will we help our single daughters cultivate wholehearted devotion to Christ, especially while they are free from the distractions of family? Today, in a world that has no regard for Sunday morning worship, we will also need to say no to many good things that our daughters may ask to do, teaching them to value being part of a local church that worships Christ. We must help them marvel that this imperfect body of believers is Christ’s Bride and that together we are being “built up together into a dwelling place for God by His Spirit” (Ephesians 2:21-22). Let us resolve to raise our daughters in the ways of the Lord rather than the ways of the world, encouraging them to find joy and fulfillment in the church and every blessing God has prepared for them, while pointing them to the One who came to serve not to be served. Places more value on her daughter’s holiness than on her temporary happiness. Resists the urge to rescue her daughter from trials that have been ordained by God to show her her need of Him. Is willing to let her daughter suffer the consequences of her sin, in hopes that she might learn to fear God who is just and holy. Prays that God will do whatever is necessary to bring her children to a personal and vibrant relationship with Him through Jesus Christ. Unfortunately, God doesn’t give us children when we are fully sanctified! Although I always had a desire to be a godly mother, as a young mom I was still in the process of grasping gospel grace and overcoming a spirit of self-righteousness. So, to be clear, these gifts are not a formula for raising perfect children. Rather, they point us to a perfect God who promises to equip and empower those who set their hearts on knowing and loving Him above all else. Years after that conversation with my daughter, she thanked me for not caving in when she had pushed hard against our boundaries. She acknowledged that, in spite of some rebellious choices, our willingness to stand firm had provided a shield against many destructive forces that warred against her. Of course, as parents, we have no guarantees that taking a stand for righteousness will mean our children will follow Christ or return to thank us one day. But, by believing the power of the gospel is greater than the power of the world, we honor the One who gave His life to save us. Whether or not we have biological daughters, when we strive to pursue and possess an increasingly godly life, by God’s grace, our lives will be a blessing to our churches, communities and loved ones. To be this kind of woman will require daily submission to Christ, remembering that He alone saves and empowers us to live the life He’s called us and our daughters to live. Finally, as we walk in faithful obedience to God’s Word, regardless of what the world or our children pressure us to be or do, we will have the opportunity to not only see the power of the gospel at work in our lives and those we love, but to put the gospel on display to a desperately needy world. Wow..Thank you. I am so excited to of found your web site! I love The LORD. My heart desire to Glorify HIM. The way you write gives me meat and lays good ways out that I can follow. Responsibilities are high ..to our husband and children. Thank you for writing things down that are true and that others can read and do. God bless you Mary Ann. I love your love for the Lord and His Word! And thank you for your encouragement to me!